A Greek Play in Action! In 1893 a group of Greek students, led by Professor Abigail Leach, set out to do what no one had attempted in over two millennia—produce Sophocles’s "Antigone" in the original tongue. 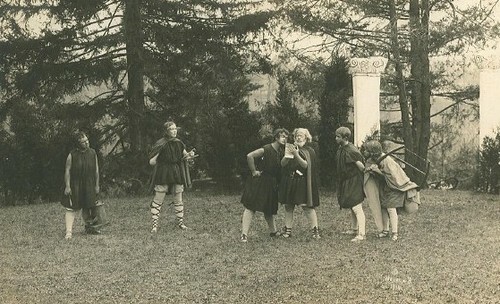 Students at Harvard, the University of Pennsylvania, and Smith College had staged Greek plays before, but not on the scale that the Vassar girls attempted it. Their production would cost almost $4,000, nearly ten times the cost of annual tuition in 1893. The cast was all female, with the exception of a bit part played by Morgan Taylor, President Taylor’s young son—ironically, as the ancient Greeks would have performed the play with an all-male cast. The ensemble was led by Helen Mildred Slade ’94 as Antigone. The costumes were designed by Mr. William H. Day of New York City, not to approximate the traditional Athenian dramatic garb of simple robes and masks but to imitate the chiton and himation, forms of everyday ancient Greek dress. Dyers were pressed into service to mix ancient hues unfamiliar to the modern eye. The scenery was designed using themes found on Greek vases, murals, and statues, and represented the entrance to Creon’s palace—steps lead up to bronze doors flanked by two Ionic-style columns, with an altar placed in the middle of an elaborate floor-mosaic design. As the original drama would have been accompanied by music, Mendelsohn’s ‘’Antigone’’ was adapted for the occasion, with Max Dessauer conducting the chorus and orchestra. In addition to being directed by Professor Leach, Williams College Professor Bliss Perry taught the cast elocution and pronunciation, while NY School of Dramatic Art Professor Franklin H. Sargent coached the girls on acting. He was amazed at the natural aptitude of the young ladies, who quickly fell into their roles and began speaking Greek as if it were their native tongue. ‘’Antigone’’ opened on May 26 at the Collingwood Opera House (now the Bardavon), to a full house of 2,000. Programs were distributed with parallel Greek/English editions of the play. The play was received as a huge success; many spectators commented that one needn’t know Greek to enjoy the performance. Professors from many prominent colleges—Harvard, Yale, Columbia, Williams, Wesleyan, and Amherst—attended. Encouraged by her success with ‘’Antigone,’’ Leach put on several other productions of Greek plays throughout her tenure. “You will be interested to know that we are to give a Greek play here again, this time the ‘’Birds’’ of Aristophanes. The Philaletheis Society begged me to let them give it for the 4th Hall Play… I am full of enthusiasm for it,” Leach wrote to Alice Howland ’96 in November 1901. The program for the “Birds” included a translation by Elsa Hillyer White and Edna Laura Kibbe. Euripides’ ‘’Iphegenia Among the Taurians’’ was performed in English by the Hellenic Society on March 23, 1907, and a second version was given three years later by Philaletheis on December 10, 1910. The next play to be done was Euripides’ “Medea” on May 7, 1915, in English. Few records (besides the programs) of these performances survive. King Theseus of Athens is spending a year of exile in Troezen with his son, Hippolytus, and wife, Phaedra. Hippolytus has dedicated himself to the virgin goddess Artemis and spurns love and anything to do with the lustful goddess Aphrodite. As punishment for neglecting her, Aphrodite decides to ruin Hippolytus through his stepmother, Phaedra, whom she strikes with a burning love for the young man. Sick with love, Phaedra confesses her feelings to her nurse, who then attempts to arrange a tryst between Phaedra and her stepson. Hippolytus rejects this offer and threatens to expose Phaedra’s unfaithfulness to her husband. Phaedra kills herself and in her suicide note accuses Hippolytus of trying to seduce her. Theseus, believing Phaedra, banishes his son. On his flight out of the city, Hippolytus’ chariot overturns when giant waves sent by the gods spook his horses, and he is killed. Theseus, discovering Phaedra’s deception, mourns his son. The next big dramatic revival of a Greek play came in 1931, as part of Professor Hallie Flanagan’s Experimental Theater program. 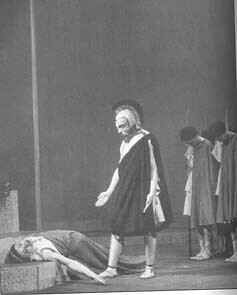 Euripides’ ‘’Hippolytus’’ was staged on December 16, 1931. The stage in the theater was enlarged to mimic the open space of the Theater of Dionysus in Athens where tragedies were originally performed; this required taking the two front rows of seats out. Though originally actors would have been used to play the parts of Aphrodite and Artemis, Flanagan decided to use statues, which were cast especially for the production by K.C. McLean. Aphrodite was modeled from the Ludovisi relief. The cast, like that of ‘’Antigone’’, was again female, this time with the exception of President Henry Noble MacCracken, who played Theseus, and Philip Davis in the role of Hippolytus. Philip Davis (who later married Flanagan) was a Professor of Greek, and also served as a consultant on the project. The production was over a year in the making, the cast having been chosen in November 1930. Elizabeth Tappan played Phaedra. Again, many professors from several top colleges attended the performance, this time from Mt. Holyoke, Bryn Mawr, Barnard, Johns Hopkins, Yale, and Columbia. The success of the production helped to cement Hallie Flanagan’s reputation as visionary in the theater world, and it was only a few years later that she was chosen to head the Federal Theater Project.